What do eCommerce Shoppers Want? Knowing how your customers shop can mean the difference between finding your products or your competitors’ products. The study by UPS “Pulse of the Online Shopper” explores shopping habits of customers, including where they shop, how they shop, research, delivery preferences, and returns. Volume 4 explores shoppers’ product preferences, pricing importance, as well as the importance of membership/loyalty programs, free shipping, and social media. Here are several helpful insights to what is important to eCommerce shoppers. While large selection is important (and the reason many shoppers begin searching at a marketplace), unique products are so important that shoppers will seek them out, working harder to find them, rather than settling for common and easy to find items. Pricing is one of the most important considerations for today’s shopper. Even mobile device users compare prices and search for retail coupons. These shoppers enroll in membership/loyalty programs, and check promotions on social media, following retailers for deals, coupons, and holiday specials. According to the study, enrollment in membership/loyalty programs is at its highest level in 3 years. Top benefits of these programs include free shipping, special discounts, free returns, and loyalty points/dollars to use on a future purchase. Of all membership/loyalty program benefits listed, free shipping was the most appealing to members. While the importance of free shipping has declined over the past couple of years, many shoppers abandon their carts because of shipping costs. This link provides a download request for Volume 1. Use this valuable information to help make decisions for winning these shoppers. And, in doing so, grow your business. Advice for Catalog Marketing from a 40-year catalog marketing veteran. Many retailers didn’t offer a better mobile shopping experience, despite Cyber Monday’s mobile sales. Which gender dominates the sport of shopping? Check out these Retail Predictions for 2018. Read this article for a full list of marketing channels all marketers should know how to use, including some “old school” channels that have been proven successful over and over. This interesting article discusses three customer service trends for 2018. When your customers visit your website, do they know it’s secure? This article from Google explains how Chrome will display secure https sites as secure, vs. “unsecure” http sites beginning July 2018. InOrder customers can check InOvation (the publication for InOrder customers) for easy steps to implement this sooner. Gift cards have been used for a long time, and for several good reasons: They’re convenient for customers and profitable for businesses. They provide privacy and flexibility, they get your brand in front of current customers, they attract new customers, and they can increase customer loyalty. Through traditional gift-giving, recipients may visit stores they might not otherwise visit. But gift cards are not just for gift-giving – they are evolving. Shoppers often buy gift cards for themselves for secure online shopping or to take advantage of discounts and rewards. And all shoppers with gift cards offer the possibility of spending more than the amount of the gift card. Smart businesses are thinking of even more ways for gift cards to contribute to their bottom lines – such as using them for store credit, rebates, promotions, loyalty programs, or even marketing them to businesses to use as employee awards. Gift cards can be physical or digital. Your customers may download them immediately after placing the order, or you may send them as an attachment in an Email. With InOrder, you can even refund a gift card to a specific customer, who may or may not be the same customer who originally bought the gift card. This means you can be more flexible about gift card sales, and your customers can be more confident that their money is well spent. This function also enables lost gift cards to be re-issued by refunding to a customer’s account and using the credit to purchase a new gift card for the same balance. For information about how to get your gift cards InOrder, contact sales@morsedata.com. The Ship Via functionality within InOrder ERP is a favorite with our customers because it maximizes profits by managing rates and fees to make sure shipping expenses are accurately recovered. Each shipping service is set up with rates, which can be conveniently uploaded from shippers (FedEx, UPS, USPS etc.) Insurance charges may also be identified/imported, along with zones that represent the distance from your shipping location to the shipping destination, and postal code areas. Manage all surcharges – COD Fees, Fuel Surcharge percentage, Residential, commercial, 3rd party billing percentage, and Saturday delivery are just some of the shipping expenses you can manage through InOrder. Set up Insurance Fees based on invoice totals (example: invoice totals $1.00 – $10.00 charges .50 Insurance). Identify shippers that accept hazardous materials. Supports the DIM Factor used by major carriers. This is used to more effectively estimate shipping rates that compute shipping based on weight per carton. When this feature is used, InOrder uses the item dimensions (height, weight, length) to determine appropriate cartons. 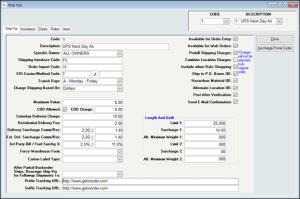 InOrder calculates the carton’s dimensional weight and compares it to the merchandise weight, and the shipping charges are computed based off the greater of the merchandise weight and the dim weight. Then the shipping charges for each carton in the shipment are summed to calculate the estimated shipping charges for the shipment. Reference EDI Carriers by their SCAC value and shipping method. Route items to a separate shipment to bypass shipping if they are electronic distribution only (no physical shipment required). 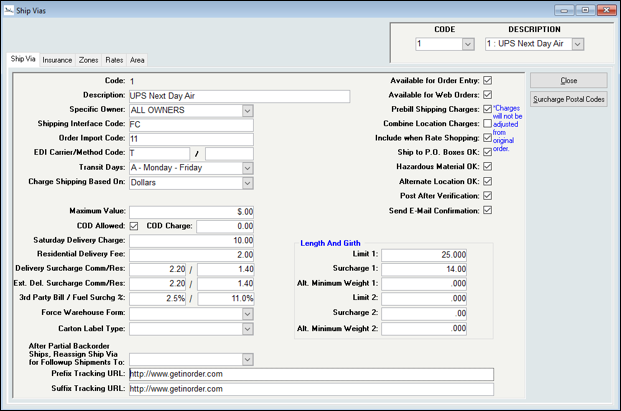 Track order shipments, and send Email confirmation of shipment according to the method in which the order is shipped. This is useful for orders that are not delivered, such as those picked up by customers. 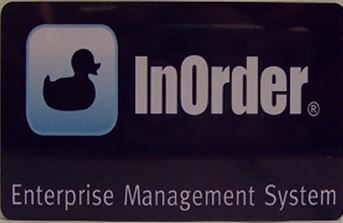 Contact us for more information on maximizing your profits with InOrder’s Ship Via functionality.